An excerpt from Russian Roulette: The Inside Story of Putin’s War on America and the Election of Donald Trump reveals an explosive claim against former National Security Advisor Susan Rice. She supposedly told the White House cyber team, who planned to fight back against Russian meddling when the evidence mounted, to stand down. In the summer of 2016, officials knew that Russia was trying to interfere with our presidential election. They didn’t know why, whether it was just to sow discord or to make sure one of the candidates won. No matter what, they wanted to protect the integrity of the election. CIA Director John Brennan and others issued numerous warnings to Russia about meddling in with our election. To top it off, they heard that Russian President Vladimir Putin actually had a hand in all of this, which shocked them because they didn’t think he’d want to have dirty hands. They also had to think of a way that wouldn’t be too partisan since Obama campaigned for failed Democrat presidential candidate Hillary Clinton. Knowing that Putin was notoriously protective of any information about his family, Wallander suggested targeting Putin himself. She proposed leaking snippets of classified intelligence to reveal the secret bank accounts in Latvia held for Putin’s daughters—a direct poke at the Russian president that would be sure to infuriate him. Wallander also brainstormed ideas with Victoria Nuland, the assistant secretary of state for European affairs and a fellow hard-liner. They drafted other proposals: to dump dirt on Russian websites about Putin’s money, about the girlfriends of top Russian officials, about corruption in Putin’s United Russia party—essentially to give Putin a taste of his own medicine. “We wanted to raise the cost in a manner Putin recognized,” Nuland recalled. Rice and Lisa Monaco, Obama’s homeland security adviser, worried the options would “box the president in” and force him to act. DO YOU NOT KNOW PUTIN? Putin doesn’t care about threats. If he did then Russia would have backed off of Ukraine and not send veiled threats to former Soviet republics. It wasn’t until October that the officials and Obama decided to go hard after Russia by letting the world know what they were doing to our election. Look, you have a country run by an ex-KGB guy who still mourns the fall of the USSR. He heads a country that has FOURTEEN dead exiled Russians in Britain the past two decades. Another may die after someone attacked him with a nerve agent last weekend. You cannot, absolutely CANNOT, remain passive against Putin or his cronies. Because any Russian/Clinton Mob meddling was all in the favor of the Democrat Party dictatorship to be established! 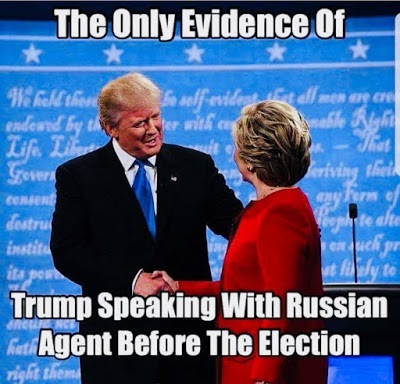 Only evidence caught of Russian Meddling…..
Of course she did. It was trivial and of a mixed nature thereby neutralizing itself. (#1) Consider the sources of the narrative: Michael Isikoff (of Simpson dossier fame) and David Corn (Mother Jones). Gee — those are fine, fine, fine primary sources. NOT! (#3) We already know that Rice is super-dirty, yet she’s just boppin’ down the road unscathed. Not much likelihood that this will affect her in any way. Rice: Stop it, you idiots. FBI: But the Russians are buying Facebook ads! What’s to stop them from –Gasp– Instagramming naughty pictures! Rice: Don’t make me get the stick. I don’t know what to think about this, and won’t, until Rages weighs in later. Why even go there? Have you considered taking up a hobby? I would suggest gardening, or drinking single-malt whiskey, or watching paint dry. Try to find something that gets you outside. Perhaps you might consider good deed doing, like volunteering at a homeless shelter or serving food at a community meal program for the poor. Try something besides being contentious. Don’t scold me. And do not tell me what to do. You are not an authority and you don’t possess more gravitas than any other human. Now you rank up there with Rages in my book. I think notamember is largely correct. Despite the hysterical nature of this article, Rice recognized the penny ante nature of what the Russians were doing, that the DNC/Clinton Campaign hacks were not conclusively sourced to Russia, and that a vigorous response might lead to more damaging actions and a greater hostility to Hillary if she became president. Once that didn’t happen, Rice and Obama were fine with poking Putin in the eye. You got to be kidding? Do you really think that the rest of us are that naïve or stupid to believe your explanation? The one comment that explains that she knew everything that was going on, and was told to stop it by whoever was above her, probably Obama, is what the person that she ordered to stop and stand down said about her, “That was one pissed-off national security adviser.” Why do you think was quote was highlighted above her picture in this article, before anything in the article was even exposed, because it shows just how important it was to proving everyone knew what was going on. In the fifth trimester since inauguration, it seems reasonable to assume this information is suspect and self-serving, as the Obama administration and establishment seek to preserve a shred of integrity and credibility. When are the indictments coming, AG Sessions? Sounds to me to be more BS fake news to keep the Russian collusion hoax going. Remember when she claimed not to know anything about the 1 a day unmaskingof Trump associates? I am almost positive that that’s a lie. Did someone check it out? Worry not. Mueller will get to the bottom of it. Susan Rice, Obama’s “LIAR WHORE”, who is involved in all of Obama’s scandals, because she is the only one that would continually and constantly lie to the American people on behalf of Obama, in an attempt to cover-up all his scandals. Susan Rice is an extremely dumb person. So, Hillary Clinton exposes the daily, inner workings of the US Secretary of State to all and sundry, and in addition, crudely signals that the decisions of the office are for sale. What are the likely consequences of such actions? What would be the natural, highly predictable reaction to the discovery that at least one US highly-placed public official is not only bribable (a sharp departure from the past) but also really that careless with our allegedly secret information? Would there not be an intense effort to capitalize on such a breach, exploit it, and rapidly assess what other holes in our defenses exist? Could she have perhaps triggered a feeding frenzy by all of our friends, enemies, allies, and would-be hackers? That it was under Obama’s watch that the Russians did their meddling must have become a difficult talking point for the Obama/Hillary loving fans. The problem is they all thought HilLIARy would win and that none of this would come out into the light of day. Because HilLIARy would just bury it and no one would be the wiser. BUT they didn’t count on the movement of people that rose up and in one loud vote cried out “NO MORE”! So now this whole Russia thing isn’t working out quite like they hoped it would. There is no evidence that President Trump colluded with Russia because he didn’t – the DemocRATs on the other hand, are not so innocent. And now they need a scapegoat. In walks Susan Rice. She isn’t that strong. She doesn’t have a ton of money (that we know of). She doesn’t have a pile of influential friends. So they figure they will offer her up on the sacrificial alter, and maybe, just maybe, they can convince her to either take the blame or they will just blame her for everything. We don’t buy it. But the Liberal Left will. And as far as they are concerned. Case closed. Yet another cover up courtesy of the Obama Administration. And there is nothing she can do about it either. She will never betray them, because without them she has no one. She’s the pet scapegoat they will burden with their sins and send alone into the forest. When she’s gone they will party without a second thought about her. A very tragic figure.